The Argentine National Gendarmerie was created, during the Ph. Roberto M. Ortiz presidency, by an act by the National Congress on July 28th, 1938. 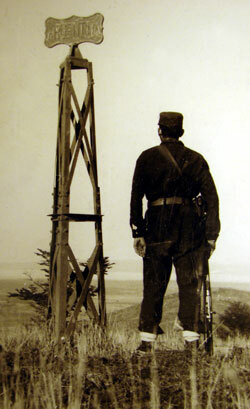 Its creation was due to a true public need in order to strengthen the international borders, ensure the security of settlers and inhabitants living in the National Territories and in the far isolated regions of the country, and replace the old Argentine Army Regiment border surveillance activities. The territory features where the Argentine National Gendarmerie should fulfill the misión and the particular qualities of its nature, caused the Force to be created as a body having an organised structure, military training and strong discipline, subject-matters still in force. That was the origin of its creation and the spirit the legislators stamped on the bill enacted as Act number 12.367: “Decisively contribute to keep the national identity in bordering areas, protect the national territory as well as the intangibility of the international border”. Its personnel was subject to a military disciplinary regime with a structure, training, military doctrine and legal educational background enabling it to fulfill police functions in times of peace and to take part in the military terrestrial component in times of war (such as the case of the Falklands War in 1982). The performance of the Force is regulated by Act number 19.349, regulating its organization, missions, functions and competence, as well as the legal provisions concerning its members. The Argentine National Gendarmerie is a security force of military nature, having the features of an Intermediate Force, depending on the Ministry of Security. Its misión and fucntions are fulfilled within the Domestic Security as well as the National Defense framework, supporting the foreign policy of the Nation. Up to Sep 2011, the Force is integrated by 3,351 officers and 25,637 non-commissioned officers, making a total number of 28,988 gendarmes with military status. “Intermediate Force” stands for an “Organization with military status and able to deter and respond to threats, crises, contingencies as well as incidents within the Domestic Security and National Defense framework, developing also proper skills for its commitment to those operations supporting the foreign policy of the Nation”. Depending on the Ministry of Security, integrating the Domestic Security System provided by Act number 24.059 and also taking part of the National Defense System regulated by Act number 23.554. The mission of the Argentine National Gendarmerie is to meet the needs related to Domestic Security, National Defense and the foreign policy of the Nation. Within the Domestic Security: to undertake the responsibilities conferred within the assigned territorial jurisdiction and in any other part of the country, as required by the Federal Justice or by order of the National Executive Power. Within the National Defense: to perform a proper and permanent control and surveillance of national borders, to offer security to operational strategic elements and to take part in those military operations arising from a joint military planning. Judicial and Safety Police within its federal jurisdiction. Auxiliary Customs Police dealing with migrations and sanitary issues. Repression and Prevention Police facing different crimes such as: smuggling, clandestine migrations and sanitary infractions. And in those cases established by special decrees and laws of the Defense System. Forest Police performing its tasks as stipulated in laws, rules and appropiate agreements. Community Safety within large cities as required by order of the National Executive Power. Safety Police of lakes and rivers navigations when this function is delegated by the Argentine Coast Guard to the Argentine National Gendarmerie. The special feature of this organization is that it is structured upon a flexible system with organization cadres and combat role that allows it to fulfill the functional roles as regards national defense, domestic security and support of the foreign policy of the Nation. To undertake duties upon requirement of the National Defense Law, such as: to control and keep surveillance of national borders; to offer security of operational strategic elements and to take part in those military operations arising from a joint military planning. To perform different tasks in its area of responsibility or in other places within the Argentine territory assigned by the Federal Justice or upon requirement of the National Executive Power, pursuant to Act number 48 or as it is stipulated in Act number 19.349 and Decree number 4575/73. To prevent and counteract breach of the peace as a consequence of social turmoil or natural desasters (Act number 24.059). Its capabilities are well grounded in its organic, doctrinary and legal features contributing to keep the Republican System rights and guarantees in force; thus avoiding a high concentration of functions (such is the case of the unique Police Force or the Army with Domestic Security duties) protecting the democratic regime balance. To take part in peacekeeping missions, humanitarian assistance and/or police monitoring as required by the international organizations and/or alliances; to offer security to the Argentine representations abroad, transnational cooperation and participating within the MERCOSUR scope. The Argentine National Gendarmerie is deployed through out the national territory, which has a continental surface of2,791.810 km, with a terrestrial border of 9,376 kmand its responsibility entails 22,443 km of highways and crossing borders. Scrubland and Mountain Rescue Sections: Training units which then become operational units. Security of the staff and personal properties. Humanitarian Assistance (White Helmet Commission). In accordance with Decree Law number 1184/97 passed by the National Executive Power, the Force is assigned with the task of providing security to Argentine embassies and consulates abroad. At the Training Center for Foreign Missions (CENCAOPAZ- its acronym in Spanish), located in the city of Mercedes (Buenos Aires), not only officers and non-commissioned officers of the Force but also personnel from other national and international Police and Security Forces are trained. Afterwards this personnel will be deployed in peacekeeping missions and/ or will be appointed as a representative to integrate the security staff of Argentine embassies and consulates abroad, based on professional and educational demands required by international agencies and institutions. At present, the following courses are being given: Immersion Course in French, Embassy Security Course and UN Civil Police Course.